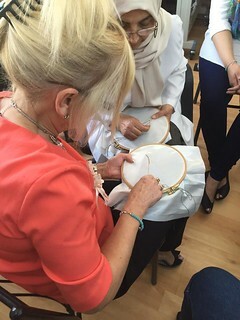 The ‘Creative Minds,’ Key Action 1 adult education project, aims to improve the skills of trainers who work with disadvantaged Muslim and black and minority (BME) women. Praxis Europe, a community interest company, identified many of these women as having few qualifications, lacking language skills and difficulty integrating into UK life, education or work. Trainers work with the women to build their confidence, self-esteem, skills and levels of health care. The organisation aims to improve their teaching systems to support disadvantaged BME women through culturally-sensitive training. The project is a continuation of previous successful work funded through the previous Lifelong Learning Programme. Trainers explore ISMEK, an adult education social enterprise organization in Turkey. ISMEK is of vital importance to learners in Turkey who have not engaged formal education. Participants see how ISMEK promotes adult learning, skills and provides learners with a living wage that can be used to help overcome traditional barriers faced by women. In total, 40 trainers from across the UK will go on the one week adult education training course to Istanbul. This will result in improved skills for the trainers working with disadvantaged communities and enhance the level of adult education provision across the organisation and its network of partners. Project co-ordinator Masood Yasin said Praxis Europe has also been successful in obtaining further funding for youth projects through Erasmus+. You can see more photos in Praxis Europe's project Facebook album. Find out more about projects working on the theme of inclusion on our widening participation webpage.